I need to try this African Chicken Peanut Stew. Don’t you think it looks delish? I love chocolate peanut-butter combinations. It is a small problem in my life. When I was a teenager I would buy a case of Reese’s eggs at Easter time and eat them all. Well, supposedly this chocolate shake is yummy. I am counting on it. As soon as I feel like eating again I am going to make it. I’ve heard this is 180 calories of deliciousness. Must buy me some cocoa today! Well, maybe tomorrow since I don’t feel like going out just yet. Not even for cocoa do I want to go out…and that is saying a lot! I have wanted to learn to make sourdough bread for years. Literally, years. About five years ago, Blythe wanted to start a bread company, so she and I learned to bake bread. Our friends, the Kendell family, taught us how and we became a pretty good little bread-baking team. We sold bread to our neighbors and friends and had a great time doing it. When I became pregnant with Annesley, I cut out a lot of the extras, and baking 16 loaves of bread a week was one of the first things to go. The whole time we were making our delicious whole wheat bread, I yearned to make a whole wheat sourdough, but I had heard it was difficult and always turned out brick-like, so I allowed myself to be overwhelmed by the whole process. 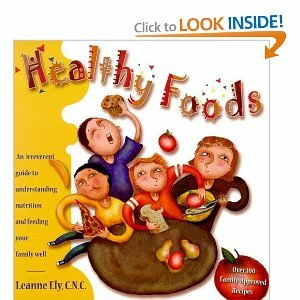 Around that same time, I organized a nutrition class with Kim Simmerman and she came up to our area and wowed us with her amazing ideas about food. This only strengthened my resolve to learn to make sourdough bread. Then, about three years ago, I bought her Granola to Green cookbook and promptly devoured it. 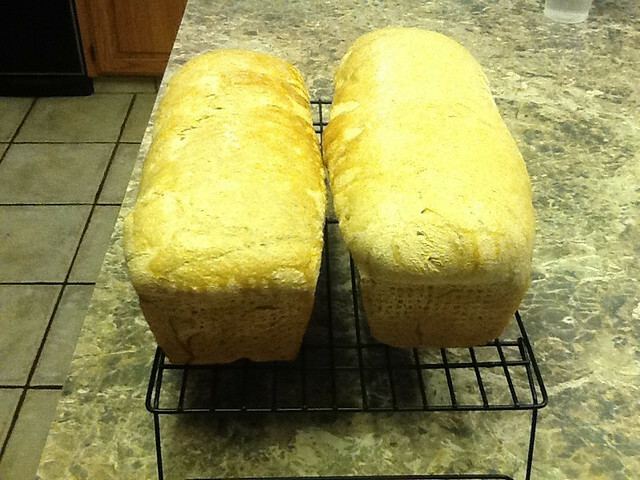 Not really, but I did make most of the recipes in the book…except the sourdough. I read and re-read the instructions over and over again and still allowed myself to be intimidated. And I haven’t baked bread since. I didn’t want to bake bread that wasn’t sourdough and I just knew I could never figure out how to make sourdough, so I didn’t make anything at all. Each week I would buy Harper’s Homemade Whole Wheat bread for $2.16 and think to myself, I can make this for cheaper…but this, THIS, is SO convenient and I am not using up my food storage of wheat and olive oil and honey, so it is worth it. See how justification works? Carol Jensen taught a sourdough class at Make It For Maggie and she graciously gave me a start! Nervously Scared out of my mind, I determined to not let her gift go to waste and I read and re-read her instructions. Then I read and re-read Kim’s instructions. Then I called Kat. Then I called Carol. Then I called Kat again. Then I read everything again. My bread turned out delicious. By some miracle, it actually was light and fluffy and had just a twang of sour. It was perfect. I figured it was a miracle and would not be repeated. But you know what? The next week I made more bread and it turned out pretty good. And now it is Monday and my third batch of whole wheat sourdough is rising right this minute. I think it is time to share the recipe with all of you so you can jump in and get to work without all the fear and trepidation that I have been through for the last ump-teen years! The day before you want to bake bread, take your start out of the fridge (this recipe is using 4 C. of sourdough start) and mix in 5 C. whole wheat flour and 5 C. water. Mix well. Cover bowl with a cloth and allow it to rest in a warm place (hard to find in my house!) for 12-24 hours. In the morning, or when ready to make bread, mix the bowl of sourdough again as separation may have occurred. Take out 1 C. of start and place in a clean glass bowl or jar. Feed this with 2 C. whole wheat flour and 2 C. cool water. This is your new start. Place your container, loosely covered, in a warm place for 8 – 12 hours and ignore it. Pour your remaining sourdough into your mixing bowl and add 2 1/2 C. cold water, 2 TB. salt (opt. ), 1/4 C. honey (opt. ), and 5 C. whole wheat flour. Mix to blend. Slowly add in more flour to a moderately stiff dough that is smooth and elastic. You should be able to stick your finger into the dough and pull it out without sticky residue on it. Continue kneading for a total of 10 minutes, including the time it took to get your dough to the right consistency. Place the dough on your counter and divide into fourths. Shape each quarter and place in oiled loaf pans. I use these and LOVE them. Let loaves rest in a warm place until doubled in size. Rising time depends on temperature and humidity, plan about 4-7 hours. Take out loaves and brush tops with butter, if desired. Place on cooling rack. Then eat them…and be amazed at yourself. At the end of the day or after 8-12 hours from when you started this whole process, find the start you set aside and ignored, put a tight lid on your container and place it in the refrigerator for up to a week. When you are ready to make bread again, take your start out the day before you want to bake and start back up there at the beginning. Now, I have to say, if I can do this, ANYONE can do this. I promise. I am NOT a baker and I swear I could win a gazillion bucks if I just kept a video camera in my kitchen at all times to catch the ridiculous things I do. But this? It is SO not hard. It is easy. It has four measly ingredients…no yeast, no oil, no gluten-enhancer, no citric acid, no potato water, no nothing…and it turns out delicious! For more information, check out this sourdough page and of course, the folks over at The Fresh Loaf are full of knowledge about all things bread-y. p.s. 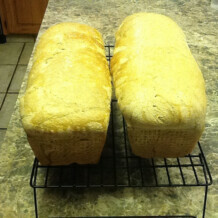 We are now feasting on our warm, fresh from the oven bread…and I think this third batch is the best yet! Tami…my 2nd cousin and dear, dear friend since the summer we were twelve…has allowed me to post her amazing soup recipe on here. Trust me…this is scrumptious…make it just like she says and then invite over some company and share it with them. Everyone will love it. We have eaten this at every Cousin Reunion, camping trip, family dinner, or anything else that Tami has attended for the past 5 years or so. I LOVE it! Boil all together for at least 30 mins… maybe an hour. It gets nice and tender. Let it cool at bit and dice (shred) the chicken – return to the broth. Saute 2 tsp. garlic (2 cloves) and 1 chopped onion in a bit of olive oil. Add to the broth. Dump it all in – let it simmer for a while. As soon as it heats up it’s ready to eat, but it’s good when it’s been simmering on low for hours too. Serve with cheese, sour cream and tortilla chips. I saw a great tip the other day for shredding chicken. After cooking chicken breasts, put them in your mixer and turn on high for about 20 seconds and you will have instant restaurant-style shredded chicken. Thank you for making it so often for me Tami…and for sharing it with my readers! The problem is, I am not a baker and I am not a whip-something-up-at-moments-notice-person either. I have anxiety in two areas of my life…cooking and sewing…and it is almost incapacitating! I made a decision a few years ago to conquer these two areas and I am on the fifty year plan to do so. I called up my mom and got some advice. Then I called Kat and got some more advice and then she sent me this recipe. I ran to Winco to get mini-chocolate chips, demerara raw sugar (never bought it before as I am a honey girl, but Kat swore I would want to use it), and allspice and then rushed home to make them. I quickly decided to double the recipe since it called for 16 oz. of pumpkin and my can was 30 oz. Soon I had a mixer full of dough, the ovens preheating, and everyone getting ready for the ball…a lil’ bit of chaos! Before the ball, I had time to cook about 2 dozen cookies. This morning I got up and made the rest…dozens and dozens of cookies later, I am done and they are cooling and being snatched up by children right and left. My plan was to freeze them and take a few to iFamily each week. I don’t know how many are going to make it into the freezer though! Cream fat and sweetener. Add pumpkin, eggs and vanilla; beat well. Stir together flour and next 6 dry ingredients. Add to batter; mix well. Stir in choc chips and nuts. Drop rounded teaspoonfuls two inches apart on a greased cookie sheet. Bake at 350 degrees for 12-15 minutes. Katie, the author of that recipe, nailed it…they are delicious! The aftertaste is even better than the first bite! I think I could eat them all day long. I don’t think I have posted a recipe for awhile and thanks to my recent cleaning of the dining room I found one of my favorite recipe books that was buried behind a gazillion other books in my magazine-style bookshelf (you should see it now…it is super-duper clean!). This recipe makes the base for 120 muffins and then you add your liquids when you are ready to whip them up. 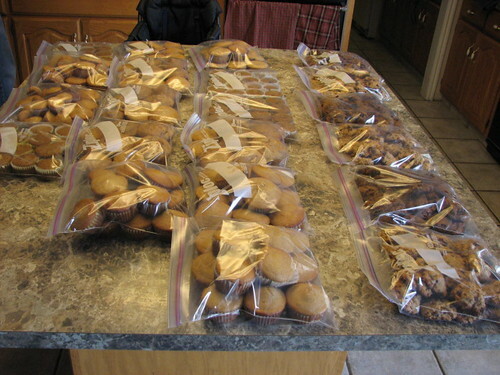 Once for our homeschool swim camp week I actually made 120 muffins at once with this mix. 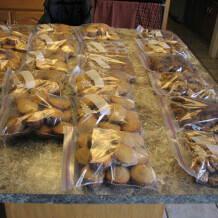 It was just a lil’ bit crazy to have that many muffins in my kitchen at one time. I wonder how well muffins freeze and thaw? If they do freeze well, maybe it would be a good idea to do again and then we could have some ready for the days we are out of the house. Mix all ingredients well and keep in a sealed container. Mix together and pour into muffin tins. Bake at 400 F for 18-20 minutes. Variations: There are 800 variations on this theme, made possible by you, the muffin-maker-extraordinaire. I have made pumpkin chocolate chip, apple pie and jam muffins. Add a teaspoon of jam to the middle by filling in half your muffin tin, plopping on some jam, and then filling the tin the rest of the way. I don’t remember what I did when I made the pumpkin chocolate chip muffins, but they were the favorite of everyone at swim camp. I am in the mood for them right now, so if someone has some suggestions for how to make them, let me know and I’ll see if I can pull myself into the kitchen to actually bake some! If I can make it to the grocery store this week, I am going to buy some kale and try out this recipe! Have you ever had kale chips? If so, how do you make them? Wash kale thoroughly, let dry. With a knife or kitchen scissors, remove the thick stem in the middle of each Kale leaf. Tear the remaining leaf into chip size pieces. Load sheet tray with one layer of Kale and cook in 350 oven for 10-15 minutes / until edges are slightly brown. I’ll let you know how they turn out. My guess is that we will love them!